Firstly I wish to thank Imogen Harris of Legend Press for inviting me on to the Blog Tour for THE TEACHER’S SECRET by Suzanne Leal, to celebrate the paper back edition publication of this book. Terry Pritchard has been a teacher at Brindle Public School for so long that his current pupils are the children of his former ones. Everyone is very happy with how things are done, until a new principle arrives and decides that some of Terry’s actions might raise a few eyebrows. And maybe she has a point? 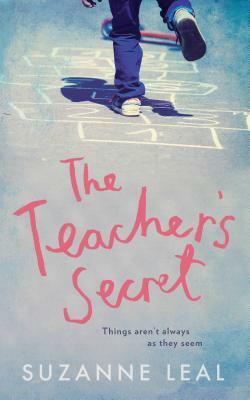 Told from multiple viewpoints, The Teacher’s Secret shows the strengths, flaws and interconnected nature of life in a small town. This is a clash of two very different generations. When the Head Teacher at Brindle Public School has to take a year out, a new Head steps in. Laurie arrives with her own set of action plans and rules for the staff and pupils alike. The school has been run the same at least over a couple of generations. It was stuck in a time wrap of the good old days when children that hurt themselves, when they fell over, could have a cuddle better without a twisted mind making more of it! And a school sing-song, with actions of course, wasn’t deemed as an accident waiting to happen and sheer waste of time. Things were going to change. Thing is you can change the rules but can you change the people? Set in a small Australian town, Terry is a bit of a Marmite character that took me back to my own days at school. I had teachers like him and still remember them very fondly by name fifty-five years later. Terry is the schools Deputy Head and only male teacher. Laurie dislikes him instantly and just sees him as danger to the children’s well-being. She is determined to get him out of the school for good, even if she has to ruin his reputation. Oh my! What a story this is. I wanted to shout at Laurie to get her head out of the rules and regulations manual and just see the register numbers as children. I really did not like this Head Teacher. Terry has a secret though and Laurie is a proper little blood hound. This story is told by a number of people and it doesn’t all centre round the school or Terry but the community in an indirect way. I liked these stories that gave the teachers and pupils a bit of background and depth. The further I read into the book the more I loved it. The last quarter of the book just turned me into a blubbering mess, requiring a box of tissues rather than a packet. Every page just set me up to cry again. I really am not one to comment much on the end of a book but this is pretty special. I am in tears again just thinking of it. Suzanne Leal is a lawyer experienced in child protection, criminal law and refugee law. A former legal commentator on ABC Radio, Suzanne is a regular interviewer at Sydney Writers’ Festival and other literary functions. She is the senior judge for the 2017 NSW Premier’s Literary Awards, and was recently asked to give the graduation speech at the University of Sydney.